"BREAKING NEWS: Video Game Designer Forces Children to Play Mini-Game for Lunch Money"
At first I thought it was an auto-generated email, but then I searched for the phrase on Google and found the real article (or a copy of the real article). Summary: Game designer tests out game mechanics on his family members. "Mr. Neil's wife says he finally crossed the line when he made their children put the families CD's back into their proper CD cases in order to earn lunch money for the day. The task had to be accomplished before the school bus arrived at 7:30 a.m."
Evil taskmaster, that Mr. Neil. I've joined the SXSW ScreenBurn advisory board for a third year, and will be helping with the public panel selection process. This year, ScreenBurn seems to be wrapped a little tighter into the Interactive component of the festival, and is bound to get more exposure as a result. ScreenBurn announced its first game design competition yesterday, aimed at "emerging designers," who merely have to write and package/present a 200-word pitch for their game. The contest opened yesterday. Semi-finalists will be announced in mid-January 2009. These semi-finalists will then construct a 3-minute slideshow presentation that graphically illustrates their concept. Finalists will be chosen to present at the event after the jury reviews these slideshow presentations. There is no fee to enter the Game Design Competition, however, each person may only submit two proposals. Free iPhone Games Are Awful: Strategy? Nearly every one of the dozen or so free iPhone games I've downloaded and tried are just plain awful. Most are barely games at all, or are simply slight variations on classic (boring) games such as Pong or Simon. I had (seemingly incorrectly) understood there was some sort of quality bar that Apple set for its first round of developers. Clearly the bar was set very, very low. I don't understand the strategy here: my entire outlook on iPhone games and small developers is now tainted. Why pay for a game if the free ones are terrible? Is Apple trying to boost the major brands by allowing this indie crap into the App Store? Confused. Disappointed. Social gaming is growing rapidly and faces increasing security challenges: educational games include high scores that can be hacked, advergames and social games collect sensitive personal and demographic information, and many games need secure payment processing. The partnership between Phantom Compass and IT GlobalSecure brings the best in innovative game design and security to our clients and their customers. Thanks to IT GlobalSecure's Steven Davis (author of the fantastic Play No Evil blog) for his support. With IT Global Secure, my company can offer a level of secure game data and systems design that other boutique developers aren't even thinking about, let alone capable of offering. How Do Web Game Monetization Venues Compare? Ryan Creighton of Untold Entertainment is doing a little experiment to compare an array of monetization venues for his Flash-based mini-game Two by Two. He'll be trying to drum up cash using Kongregate, J2Play, Newgrounds, MochiAds, Flash Game License, Addicting Games and finally Armor Games. Thanks to Ryan, I get to see how a very simple Flash game makes money (or doesn't) across the various venues. So far, Armor Games rejected Two by Two completely, but at least they did it within 24 hours. I think Ryan's experiment is definitely worthwhile, but it's not exactly going to tell us how 'any' Flash game would do--we need more test-subjects. Maybe later this year I can repeat his experiment with one of Phantom Compass' upcoming Flash games. On a related note, I've been running Google AdSense text ads on a suite of re-skinned and tweaked games (I didn't design or code any of them), and probably make about fifteen dollars a month on click-throughs. Nothing to write home about, but I haven't exactly optimized the pages for ad-space--and the games aren't very good, either. Maybe once AdSense for games becomes a reality, there'll be easier cash to be made. I had the privilege and pleasure of mentoring 8 teams of talented and open-minded documentary filmmakers last week as part of the Producers Institute for New Media Technologies for BAVC in San Francisco. This is the second year in a row I've been invited down to share my game design experience with the Producers Institute. While last year was a fantastic experience as well, this year focused on projects acting as catalysts for real social change--this emphasis sets the Producers Institute apart from other cross-media labs and workshops I've participated in over the last couple of years. Most of the work I do is commercially oriented, so it was a nice change of pace to work with people with a genuine interest in positive social impact. I spent most of my time consulting with Susana Ruiz (best known for creating Darfur is Dying) and her team--they're working on a game about the death penalty, imprisonment and flaws in the U.S. justice system. Not only is the game "about" these issues, but Susana's company Take Action Games specializes in actual results--what can a game motivate people to actually do? Darfur is Dying showed that game play resulted in communications sent to the U.S. government. It will be interesting to see what positive action this latest project will result in. Had a fun chat with Erik Loyer this morning while breakfasting in a hotel restaurant. We were discussing how Portal forces the player to jump through the designers' hoops--it occurred to us that in Portal's case, the expression "jumping through hoops" becomes quite literal. Insert collegial chuckling here. Also had the chance to meet up with security expert and game-guy Steven Davis last night over dinner. Much discussion of tabletop gaming's relevance to digital games and other frothy matters ensued. And then I had to run back to help out at BAVC's Producers Institute. Insert whip-cracking sound-effect here. At the end of this week, I'll be flying from chilly Toronto to chilly San Francisco to reprise my role as a mentor for the Bay Area Video Coalition's "Producers Institute." Last year's institute brought teams of brilliant and enthusiastic documentarians together with a squad of knowledgeable mentors under the nurturing guidance of BAVC's staff to explore the intersections of linear narrative and designed interactivity--I expect this year to be just as productive and energizing. On June 3 I will be moderating a panel entitled "The Gaming (R)Evolution" as part of BAVC's Innovation Salon series, featuring panelists Cathy Fischer (ITVS Interactive), Alice Petty (Discover Babylon Project), Susana Ruiz (Take Action Games), and Richard Tate (HopeLab). The main topic of discussion will be so-called "serious games" and their application towards social good. While I'm in town, I should have some time to meet up--drop me a line if you're interested in grabbing a drink some evening. [tonywalsh at phantomcompass dot com]. 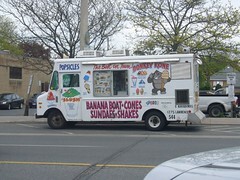 Apparently Donkey Kone is an ape who will punch you in the face with a fistful of ice cream. Something tells me Nintendo had nothing to do with this.